Our managers were notified of you request. We'll get back to you as soon as we can. 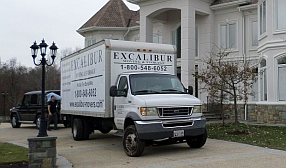 Located in Rockville, Maryland, Excalibur Moving and Storage is a full-service moving company offering local and long-distance moving services, storage, and packing assistance. Our services are available for all residential and commercial needs and we are known for providing professional and efficient services for your needs. The owner at Excalibur is backed by more than 10 years of experience providing first-class services, and each of our team members has at least 5 years of personal experience in the business. Whether you are moving your family across the country or you are moving your local shop down the block, we have the knowledge and experience to make your move as easy and stress-free as possible. Our goal is to provide you with honest and reliable services, and no job is too big or too small for our team. 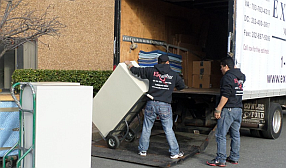 We are proud to offer you complete moving services and our local storage are available free for the first 30 days. 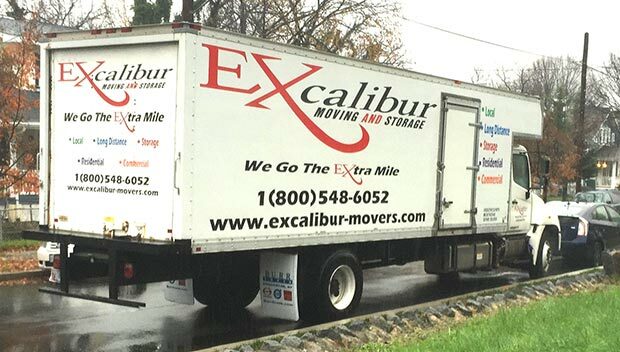 Choose Excalibur Moving and Storage for all of your moving needs and discover why we are a leader in our field. 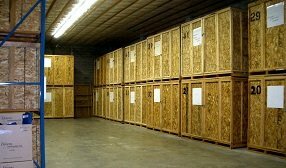 Whether you are looking for long-term or short-term storage we have just what you need. First month of storage is always free!!! The company was very pleasant to deal with when setting up the appointment. The moving crew showed up on time, they were actually a little early! Everything went smoothly, we allowed for plenty of time. The only thing was the weather, we didn’t have any salt but the mover managed to deal with the ice with no salt. The only thing I would suggest would be to have salt in the truck. From the very beginning they Excalibur was very professional. Once I got their estimate for my move, unlike other companies, they didn’t call me daily to persuade me to hire them, which was very nice. Once I decided to go with them, i went to pick up boxes to start packing. I was given enough boxes, different sizes, for my belongings, many different tips on how to pack, many rolls of tape (I think it was 9 rolls), and a ton of paper so that I wouldn’t have to worry about any supplies for my move. Once it was getting close to my moving date, they called to confirm the appointment. The appointment time was between 11 am and noon. So really, I was expecting them closer to noon if not 1. To my surprise, at around 9:45 am they called to tell me they were half an hour away. So, i was caught still packing. Nonetheless, I am very glad they showed up early, now I have most of the day to unpack and get settled. Once they got to my place we went over everything that was going to be moved and all of the paperwork and it didn’t count as “moving time”, which was great. Once they got to packing, they made sure to pack everything with as much protection as possible and they moved very quickly. Once they got to my new place, since its wooden floors they put protective layers on the floor and were very careful to not make any scratches and were very protective of the walls and such. I am very much impressed with their service and their hourly rate is a really good deal. Will definitely hire them. I called Excalibur a day before I needed to move, and they had a spot for me to reserve. They came the next day, while calling me to let me know they were on their way first. They moved my room out very quickly and efficiently. All of my things were stored onto the truck with protective coverings and with care. I’d definitely use them again. I hired them when my wife and i were moving, and they were fantastic. They arrived on time, called ahead of time, packed everything professionally, worked quickly, and were very pleasant to interact with. This was really the best moving experience I’ve ever had. My move was pleasant and easy – I just wish I had things 100% ready to go for the team to move everything instead of just all of the furniture. There was a little confusion over the moving date, which was likely my own fault, but Excalibur was able to adjust and come the next day – I only paid a 1-hour travel time penalty. Process was quick, easy and super convenient. Staff was friendly. Our only issue was that additional wrapping costs (boxes, plastic, tape, etc.) were not disclosed prior to arrival at my house. We were donating a bedroom set and had no idea that there was going to be almost $200 additional to wrap the mirror, lamps, etc. They were on time, pleasant and so attentive to every detail. My movers were extremely professional when moving belongings and handled them with care and were fast. I’ve never seen a couch wrapped so quick in my life, lol. Im 9 mo pregnant and they made sure I didn’t lift a thing!